I’m not finished with Brother Akbar’s answers, to my questions, while in Africa with the Honorable Minister Louis Farrakhan, many years ago. I’ll get back to that interview. I also interviewed Minister Abdul Rahman Muhammad. Jabril Muhammad (JM): Minister Rahman, you’re a long-term follower of the Honorable Elijah Muhammad and Minister Farrakhan on this side of the departure of the Honorable Elijah Muhammad. I want you to recollect when was the first time you ever heard the Honorable Elijah Muhammad talk about his going away to be with Master Fard Muhammad. Please give what you recall of his conviction that he would not be dead, even though most people might think that. When was the first time you can remember hearing that, when was that, and what were the circumstances? What did he say? Minister Rahman (MR): The very first time, I heard him speaking about that was when I had made a report one morning, and he was sitting—at the old house on Woodlawn Street—not the Palace, the one next door to it. And he told me he was going away to get a book, the new book that would lead us into the Hereafter. And he told me to hold on to the teachings. He said he’d be gone about a little over three years. That was the first time he told me that time. JM: When, what year was that? MR: This was around 1970. ‘70 or ‘71, no later than that. Another time, through my own study, I found him to be a man like Moses, and Moses, according to the Bible lived 120 years of age, and I made a reference to that one day and he did not deny that. And another time—and he had told us this many times at the (dinner) table—that if Allah couldn’t save him, he couldn’t save none of us. So that gives me the equipment or the knowledge to believe that the Honorable Elijah Muhammad is still alive, because at still another time, I heard him say that he and Master Fard Muhammad would be backing up Minister Farrakhan; that he’d have two of them backing him up. JM: You heard him say that? MR: Yes, I heard him say that. 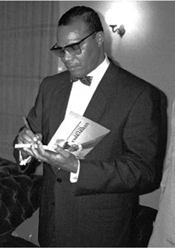 JM: Was Minister Farrakhan present at the table on that occasion? MR: I think he was. But I heard him say it more than once. And he also told me he cracked Farrakhan. As we have in our lessons, The Problem Book, that Master Fard Muhammad cracked an atom into ten million parts. So when he told me he cracked Farrakhan, I recognized and realized what he was talking about. Through Farrakhan being cracked, the knowledge being cracked, he would be able to get millions of our people into the fold of Islam. JM: Now, this time when you mentioned the age 120, what was the expression on his face? MR: Well, he smiled. He agreed with it. JM: He didn’t say anything? And what was the look on his face? MR: No, he did not say anything. But the look on his face was that he was in agreement with what I had said. MR: Those are the main things, I can think of right now. The main thing that sticks in my mind, he said that if Allah couldn’t save him, He couldn’t save none of us. I tell people that today. I say if you’re afraid for Minister Farrakhan—naturally, for our love for him, we’re concerned about that—but we know we have a God, we know if—I don’t think—but know that none of us would be here if we didn’t think that Great, Great, Great Master Fard Muhammad could save us from the enemies of Islam. JM: Have you ever heard him speak about the Mother Plane? What were among the most interesting things you ever heard him say about it? MR: I think that the most interesting thing that stuck in my mind was that one minister—I can’t recall who he was—he tried to suggest to the Messenger that the Mother Plane might be a myth, or spiritual, a spiritual something that was not physical. And the Messenger got quiet. His eyes got sharp and he stared at the Brother and told him, “The Mother Plane is nothing to be played with, brother. It’s for real.” That stuck in my mind for a long—it’s still there. I can see the look now that he gave this Brother. ‘Cause the Brother was trying to—he had disbelief in the Plane. He tried to ask the Messenger was that just spiritual teaching, you know, about a spiritual thing that was not also physical. The Messenger got quiet, and tightened his jaws and looked at the Brother real sharp and told him it was not to be played with. It does exist. And that was the main thing that stuck in my mind. I’ve seen the Messenger teach that subject in Chicago, and he had Minister James Shabazz, at that time draw it on the board. And if Minister James made one mistake, one dot, one line out of the way, the Messenger got on him severely for mis-drawing the Mother Plane. Yes, Minister James—the Messenger would really get on him, and I felt sorry for Minister James, ‘cause he had the whole audience out there. A Temple full of people; he’s up under the fire of drawing the Mothership for the Honorable Elijah Muhammad, while he’s teaching. It was really something to behold. JM: Now, have you ever seen him—in what we call the Palace now—or heard where he seemed like he was playing sick? MR: Oh yes, plenty of times! I’ve gone to the old house, and we’d received letters from the Secretary saying that the Honorable Elijah Muhammad was ailing. I would go to see him, maybe the next day. I would see him moving as fast as any FOI, in the mosque, zipping through the house—zooop! I don’t know whether he recognized me seeing him, or whether he wanted me to see him or not. But then I could come to dinner that night, and he would act like he was just was making it. So I’ve seen that plenty of times (Both laugh). JM: Give me another example. MR: I’ve seen that more than once, what I just told you about. He’d be moving through the house so fast, and then when he come to the dinner table, he’d be holding his hands and say these old bones of his, is this or that—I’m sure he fooled all of us, ‘cause I’d have been fooled, really fooled, if I had not seen him earlier. I think he done it to try our beliefs. I think he’d trying to see just how sincere we were. But I definitely saw him zipping through the house—zip! But then that evening, he was just moving slowly; all but making it. JM: Have you heard of any instances where other people have seen something like this that has stuck in your mind? For example, I’ve heard that Brother Sultan and another Brother were escorting him down the stairs, one day at the Palace, and when he was about two or three steps to the landing, he just moved rapidly from them, quickly turned around, looked at them and smiled. MR: (Both laugh) They were holding on to him, huh? Like he couldn’t walk (Still laughing). Yes. I’m sure that happened. Praise be to Allah for that great man! We could never thank Allah enough for him. So you get some good stuff here, brother. I know whatever you put together behind this, I know it’s going to be a wonderful citation, and beautiful for Muslims to read and behold, and assure them that the Honorable Elijah Muhammad lives. JM: Were you at the Saviours’ Day in 1981, when the Honorable Louis Farrakhan announced that the Honorable Elijah Muhammad was still alive? MR: I don’t think I was. I don’t think that I had got back into the fold at that time. JM: But you heard him at some point. JM: What were your thoughts about that? MR: I heard him teach it strong, he taught it real strong in Gary, Indiana. What was that—’83? JM: Yes, I think it was. MR: Yeah, he was teaching real strong that day. JM: What did you think about when you first heard him say that? MR: I was so hurt when the Honorable Elijah Muhammad supposed to have left us—died, as they claim he did. I was so hurt. And years later, to hear Minister Farrakhan say that he was alive, well, the first time I heard it, I really became relieved. And began to believe it. But I couldn’t see it as visually as he could at that time. So, his belief in that, grew in me, and for that belief to continue to grow in me. Today, I just don’t have faith that he’s alive, I know, through that growth. So, from his belief, and I know, for he wouldn’t be out on his own without some communication coming from the Two of them—Master Fard Muhammad, and the Honorable Elijah Muhammad. JM: When you first heard of Minister Farrakhan’s vision, back in 1985, what were among the thoughts that came into your mind?